Opponents of pension reform in Illinois are quick to malign self-managed accounts, such as 401(k)s, as too risky for government workers. They claim that workers are better off with pensions paid for and run by the government, as if that somehow makes them more secure. But there are three key problems with that argument. The argument implies that government-run pension funds invest in markets that are immune to market risk. That’s simply not true. Pension funds invest in the same markets that traditional 401(k)s invest in. In fact, they often invest in even riskier assets to try and boost their returns. A look at the Illinois Teachers’ Retirement System, or TRS, portfolio, for example, reveals a portfolio of investments in junk bonds, real estate, derivatives and private equity. TRS has more than $1 billion invested in bonds that Moody’s Investors Service or S&P Ratings Services rate as junk. The bottom line is pension funds take risk and often fall short of achieving their required rates of return. Pensions run by Illinois politicians are much riskier than self-managed retirement accounts. Just look at the results of Chicago’s pension funds. The police pension fund has just 25 percent of the funds it should have to meet its future obligations. The firefighter fund has just 31 percent. Those funds are broke, and without real reform they’ll run dry in just a few years. Chicago’s municipal workers, laborers, teachers, and transit and park workers also find themselves in the same predicament. Collectively, those funds have less than half the funding they should have to pay future benefits. Politician-controlled pension funds have been run into the ground. Most importantly, self-managed plans do pretty well over the long-term, as long as money is set aside and invested in a disciplined manner. Just how well would a public-sector worker retiring today have done if he had invested in a 401(k)-style account his entire career? Would he come out ahead even after the bursting of the tech bubble and the Great Recession? Assume the worker started in 1978 and invested 15 percent of his salary each year, just like workers who participate in the State Universities Retirement System’s self-managed plan do (SURS workers contribute 8 percent of their salary toward their self-managed account and the state matches the contribution with an additional 7 percent). Also assume his salary would grow at 4 percent each year, allowing him to retire with a final salary of nearly $100,000 – that is the salary with which career university workers with more than 30 years of service now retire. Last, let’s assume that he invested his entire portfolio in the S&P 500 index – a diversified portfolio of stocks. Turns out he’s done pretty well for himself. At the end of 2013, he retired with nearly $2 million in assets. Over his retirement, he’ll have more than $200,000 a year. 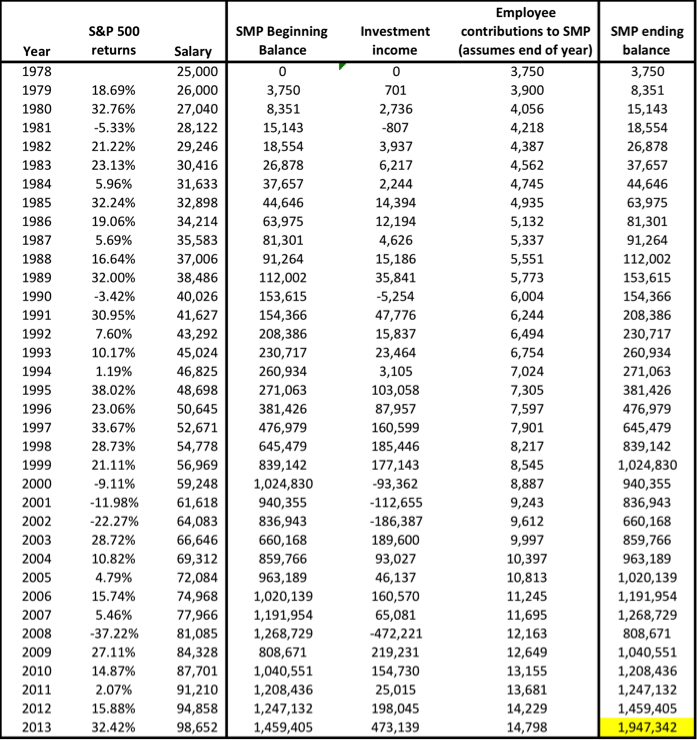 Note: assumes 4 percent annual salary growth; 15 percent of salary is invested yearly in self-managed account; all funds are invested yearly in S&P 500 index. What if the plan had invested in less risky assets? Well, it turns out that would have performed pretty well, too. Investing 50 percent in the S&P 500 and the other 50 percent in a bond portfolio similar to the Barclays U.S. Aggregate Bond Index would have yielded $1.45 million at retirement. Opponents of real pension reform may want to take a closer look at just how poorly politician-controlled pension funds are doing. They may finally realize it’s time to take that control away and put it where it truly belongs – with government workers.